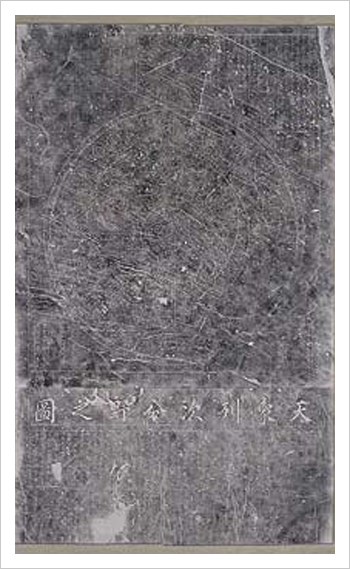 A planisphere chart carved on a rectangular stone block produced in 1395, named “Cheonsang yeolcha bunya jido,” National Treasure No. 228. From time immemorial people have observed the heavens and the motions of celestial bodies, and recorded stars and constellations. In Korea, the people of the ancient Goguryeo Kingdom left behind tomb murals depicting various stars and asterisms that embodied their astronomical knowledge. Star maps provided the basic guidance in astronomical observation. 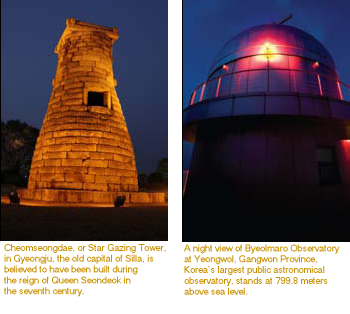 In traditional Korean astronomy, the heavens were regarded as reflections of the human world. The celestial sphere was divided into 28 lunar mansions in three schools, whereas traditional Western astronomy was based on 12 constellations straddling along the ecliptic. The stars and star groups were named after kings, palaces, markets, and familiar figures like the Herdsman (Altair) and the Weaver (Vega), or the Seven Stars of the Northern Dipper (Big Dipper). Our ancestors believed that the heaven, earth and humans were organically interrelated, so they sought to interpret human affairs by carefully observing unexpected events taking place in the celestial world. As stars were regarded as intermediaries between heaven and man, they were used as important clues in reading the will of heaven as well as predicting the fate of humans. Particularly, the kings of succeeding dynasties utilized constellations in governance as they believed that changes in the heavens were related to the fortunes of their kingdom. The celestial sphere is divided into 12 zones with 1,467 stars on Cheonsang yeolcha bunya jido, based on an earlier astronomical chart made during the Goguryeo period (37 B.C.-A.D. 668). of a stone-carved astronomical chart was delivered to him; the stone carving made in Goguryeo (37 B.C.-A.D. 668) was known to have been submerged in the Taedong River and lost during the war that led to the fall of the ancient kingdom. Taejo ordered court astronomers, including Gwon Geun and Yu Bangtaek, to produce a new astronomical chart by supplementing the ancient version. Eleven scholars at the court office for astronomical observation, Seoungwan, observed stars to eliminate the errors arising over seven centuries; the result was a far more detailed and precise chart containing not only the names of stars and constellations but rich astronomical information. This new chart, completed in 1395 and named “Cheonsang yeolcha bunya jido,” meaning a “planisphere chart of different celestial zones,” is now Korea’s National Treasure No. 228. It is the second oldest stone-carved astronomical chart in the world. This 14th-century planisphere chart, 122 centimeters wide and 221 centimeters long, divides the celestial sphere into 12 zones. It presents a total of 1,467 stars forming 283 constellations; the stars are depicted in different sizes to represent different degrees of brightness. 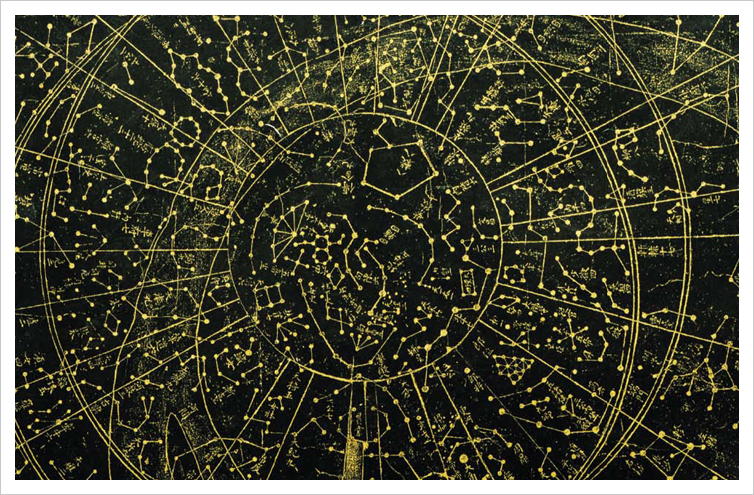 The chart has more than three times as many constellations than Western astronomical charts produced during the similar period, which have 88 constellations. The outermost circle measures 76 centimeters in diameter and has the North Star at the center along with the sun’s ecliptic and the equator equidistant from the North Pole and South Pole. The chart delineates the paths of movement of the five visible planets (Mercury, Venus, Saturn, Mars and Jupiter) and subsequent seasonal divisions. The Joseon astronomers precisely recreated the night sky observed by people of Goguryeo with incredible knowledge and expertise. 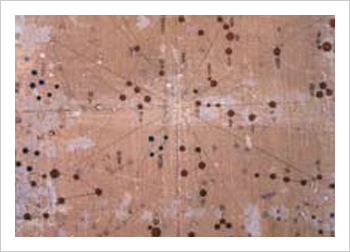 “New Astronomical Chart” (Sinbeop cheonmundo), made in 1472, is at Beopju Temple on Mt. Songni, North Chungcheong Province. The invaluable star chart went through as much difficulty as did the Korean nation over the centuries. The stone chart was severely damaged during the two major wars with the Japanese and the Manchu from the late 16th to the early 17th centuries. A marble replica was produced during the reign of King Sukjong (r. 1674-1720) to be preserved at Gwansanggam, the court astronomical office which succeeded Seoungwan. During the reign of Yeongjo (r. 1724- 1776), a separate pavilion named Heumgyeonggak was built on the grounds of the astronomical office to house the original stone chart and the marble replica together. When the Joseon Dynasty collapsed with Japan’s annexation of Korea in 1910, however, nobody took care of the charts and they disappeared from the palace. The whereabouts of the astronomical charts remained unknown until the 1960s, when the original stone carving was found abandoned on the grounds of Changgyeong Palace which was turned into a zoological park during the colonial period. A family needing a table for their picnic there happened to find a stone block under the eaves of the Myeongjeongjeon pavilion. While covering the stone with cloth to place their food on it, the family noticed the rectangular block was carved with strange patterns of numerous small dots. Thus the priceless astronomical relic was brought to light after being discarded in grass to be trampled under countless feet over a half century. A folding screen with “old and new” astronomical charts from the East and the West, respectively, designated Treasure No. 1318. “Cheonsang yeolcha bunya jido” is a valuable cultural treasure attesting to the views of the universe of ancient Koreans through the stars and constellations they carefully observed and recorded. It contains the wisdom and cosmological perspective of the people of Joseon who loved the heavens, an outcome of their endeavors in astronomical science and culture, a tradition dating to Goguryeo and further back to Old Joseon, the first kingdom in Korean history.